Octane Number and Cetane Number are the standards to measure the tendency of fuel to ignite spontaneously. Octane number measures the performance of gasoline while cetane number measure the performance of the diesel. The fuel having high octane number has the low cetane number and high cetane number fuel has low octane number. This is one reason why we can’t use petrol in a diesel engine and diesel in petrol engine. Octane number of a fuel defines percentage of Iso-butene present in the mixture of Iso-octane and heptane under standard operating conditions. Octane rating signifies the ability to resist auto ignition when used in the gasoline engine. Due to compression of air and fuel together, gasoline tends to ignite at the end of compression by spark created by spark plug. The use of gasoline having low octane number create the problem during ignition. The fuel having high octane number takes more time to burn but provides maximum efficiency to the gasoline engine and opposite to it fuel having low octane number tends to adopt auto combustion easily due to the effect of excess heat and pressure. Cetane is a type of chemical compound known as a Hexadecane. This compound tends to ignite spontaneously under compression hence assigned as a Cetane number of Hundred. Cetane number of particular of a fuel can be defined as the percentage volume of n-hexadecane in the mixture of n-hexadecane and 1-methylnaphthalene which is responsible to provide ignition delay period. It is exactly opposite of the Octane number and all the diesel fuels are indexed to cetane based on their performance of ignition under compression. Cetane number measures how quickly the fuel starts to burn inside the compression engine. Octane number and cetane number are exactly opposite to each other. They can be differentiated based on few considerations. 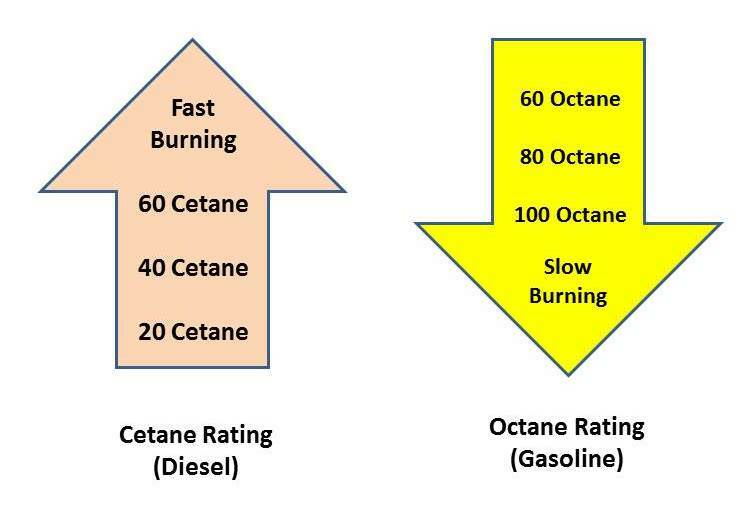 Following are provided some basic difference between octane number and cetane number based on the general basic points of difference. Octane Number measures the ability of a fuel to resist pre-ignition of the fuel in the gasoline engine. Fuel having high Octane number is considered as Ideal fuel for the Gasoline engine. Cetane Number measures the ignition delay of the fuel in the diesel engine. When Cetane number is higher, the ignition delay is short and the fuel having high Cetane number is considered as the Ideal fuel in the diesel engine. The higher number between both scales define high quality. Higher Octane number gives better quality petrol as the higher octane number of fuel gives greater resistance to the fuel for auto ignition under high combustion pressure and heat which results in greater efficiency of the vehicle. Another fuels consisting higher anti-knocking property is rated with other scales like octane performance. Higher Cetane number defines better quality diesel. Cetane numbers are suitable for only light distillate diesel oil and for higher distillates other scales are used. Octane Number is used in a spark ignition engine which is otherwise known as an internal combustion engine or petrol engine. 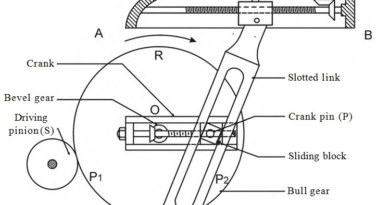 In this type of engine there is chemical delay and if the delay is more than auto ignition will be less because flame front will reach end gases before a chemical reaction takes place. Cetane number is used in the compression engine which is known as the diesel engine. Here physical as well as chemical delays are present in the engine and when this delay is more combustion reaches the maximum value and sudden unfavourable blast may occur. In Octane number scale fuel having higher octane number tends to ignite rapidly due to larger ignition period and gives fewer tendencies to knock in Gasoline engine. In Cetane number scale is high, the cetane value of the fuel shows readily ignition and gives fewer tendencies to knock in the diesel engine due to less ignition delay period. Octane rating is decided according to the octane number of Iso-octane which is 100. The octane number of Iso-butane is hundred and zero for n heptane hence every fuel is rated between zero to the hundred. Iso-octane has maximum octane number the hundred and N-heptane has minimum octane number zero. Commonly octane number of fuel ranges from 87 to 95 in gasoline fuel. Cetane rating is measured according to the ignition of the cetane. N-hexadecane consists maximum cetane number which is the hundred and 1-methylnaphthalene has minimum cetane number zero. It ranges from 30 to 35, fuel exceeding this number is known as poor fuel. Higher octane number gives greater resistance of gasoline for premature combustion which is known as knocking. Higher cetane number is responsible for the rapid ignition of the diesel which gives excellent performance of the diesel engine. 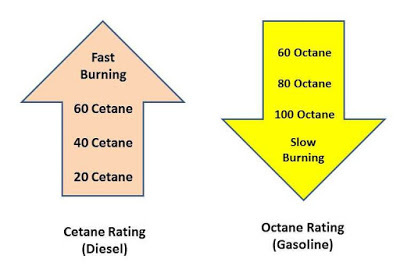 This is all about octane number and cetane number and key differences between them. If you have any query regarding this article, ask by commenting. If you like this article, don’t forget to share it with your friends. Subscribe our website for more informative articles. Thanks for reading it.